Surrounded on all sides by National Forest and nestled between Eugene and Bend, Oakridge, Oregon is home to some of the world’s best mt. biking. Mt. Bike Oregon is an opportunity to explore this region’s trail treasures. For 14 years, riders have been coming from all over the world to be a part of this special experience. Oakridge is best known for lush singletrack, tucked deeply in the woods. There are trails for a variety of riding styles, some more technical and others flowy. At Mt. Bike Oregon, everything’s included so you can hop on a shuttle and ride your heart out all day long. Expert guides are on every ride to ensure no one gets lost or goes down the wrong cutoff. Though these rides are shuttled, this is no downhill fest. You’ve got to earn your turns at Mt. Bike Oregon and every ride includes some rewarding climbing. There is no other mt. bike festival quite like Mt. Bike Oregon. At least that’s what we think, and a long-time IMBA staffer who traveled the country going to mt. bike festivals once told us the same exact thing. The event is non-competitive, and very low key. It’s well organized, not flashy, and in the true spirit of Oregon it’s not overly branded Oh, and the nightly beer garden features regional beer, wine and cider absolutely free. Cause that’s how we DO. Breakfast and lunch are included, as is camping, shuttles, demo bikes, guide service, clinics and more. Three days of riding, four days of the event, three nights of camping – all for only $400. We think this event is a steal of a deal. As an all-inclusive event with camping on site, as many as 350 riders live together for the weekend in a huge open field with plenty of room to spread out. Mt. Bike Oregon is large enough to have a cool festival feel, but small enough to where you’ll truly get to know some awesome new people. Mt. 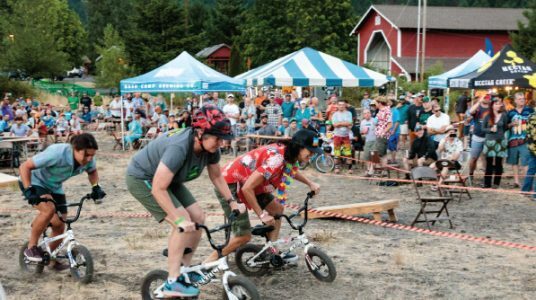 Bike Oregon is July 20-22 and August 17-19. You can ride just one weekend, but we recommend you go to both for the full experience and so much good riding.